If you are, or have been, an expat living in a foreign country, you know that friends and family at home often have exaggerated ideas about how exotic or dangerous or fascinating your life as an expat is. Of course, sometimes it is, but mostly your days are filled with simple activities like, say, dyeing your hair, reading a book, or meditating on the Meaning of Life. Just like you’d do in Buffalo, New York, or Paris, France. And so, one ordinary day in my expat life in Armenia, a small country nestled in the Caucasus Mountains, I did a very ordinary thing: I went to the post office to mail a card. My few words of Armenian should be enough for the task of getting the correct postage, especially since the card is a simple piece of mail with the USA part of the address also written in Armenian, in the unique Armenian alphabet. By me, yes. I copied it carefully from an example, with my tongue sticking out in concentration, just like a 4-year-old trying to write her name. Properly printed it looks like this: Ա Մ Ն , but I digress. The post office is a drab little storefront room, but the women behind the small counter offer a bit of color. One is a matron with pitch black hair and neon-orange lips, the other a young thing with bleached blond hair and big lips outlined in dark red and filled in with a pale pink. They look at me soberly. I offer them a cheery barev dzez and they return it with unrelenting seriousness. I slide the card in its square envelope toward them. “Amerikayi,” I say for good measure. It’s written on the envelope in big, clear letters, but I might as well just say it for the sake of making a sound. The matron lady – the one in charge, I think — picks it up and studies it for a few moments, frowning in deep concentration. Then she shows it to the bleached chick who also studies it. “Amerikayi,” I say again. They both nod, acknowledging they understand. Then they study the envelope some more, talking to each other in grave, concerned tones. What could possibly be wrong? Have they never seen an envelope with an American address on it? I am mystified by their behavior. Fortunately there is no one else in the post office waiting to be served. Maybe I am the only one who’s been here all morning and these two are making the most of my visit. Maybe this is the most excitement they’ve had today. It must be very boring sitting here all day with nothing to do but boil little cups of muddy coffee on a hot plate and stare at the sunny streets beyond the grimy window where everybody else is frolicking in the sun shine, or so it must seem. Finally, after much pointing and discussing, the boss lady turns to me and struggles out a few words in English while pointing at the envelope. “Address here,” she says, pointing to the lower right-hand side of the envelope. “Your address here.” She now indicates my return address in the top left corner. I have no clue what she means. My return address is sitting nicely right where she is pointing. I nod, and point to it. Aha, now we’re getting somewhere. I, a person who has addressed hundreds of cards in my lifetime – Christmas cards and birthday cards and Mother’s Day cards – and sent them from and to all corners of the planet without ever any complaint or problem, have somehow failed to satisfy the Armenian postal lady behind the counter in this tiny post office. She hands me a new envelope, conveniently available, points to the exact location for the two addresses and indicates a rickety table behind me where I can fix the problem. Fortunately I do not have a plane to catch, nor any inclination to go postal over this. Like a good girl I write the recipient’s address all the way in the lower right hand corner, as instructed. It looks quite silly to me, but who am I to make fun of this? I am a guest in their country. I’ll write the envelope the way they want it if that makes them happy. Happiness is nice. I’ve got lots of it and I’m willing to share. I pay. I smile. They smile, which is not nothing in this land of unsmiling people. I walk out into the sunny spring morning, stroll down the street, laughing out loud to myself. People are staring at me. I’m a crazy foreign lady. Life is full of these insignificant little incidents that add color to your expat life and give you a chuckle. Tell me one of your tiny tales and so offer me and everyone else here a smile or laugh. Your good deed for the day! Oh, and the lamp, you ask? It was on a bedside table in a hotel in Armenia. I thought it was worthy of being immortalized by camera. You are truly blessed to love the life you have! You’ve been everywhere and have immersed yourself in the culture of each place you’ve pass through or lived! Kudos! 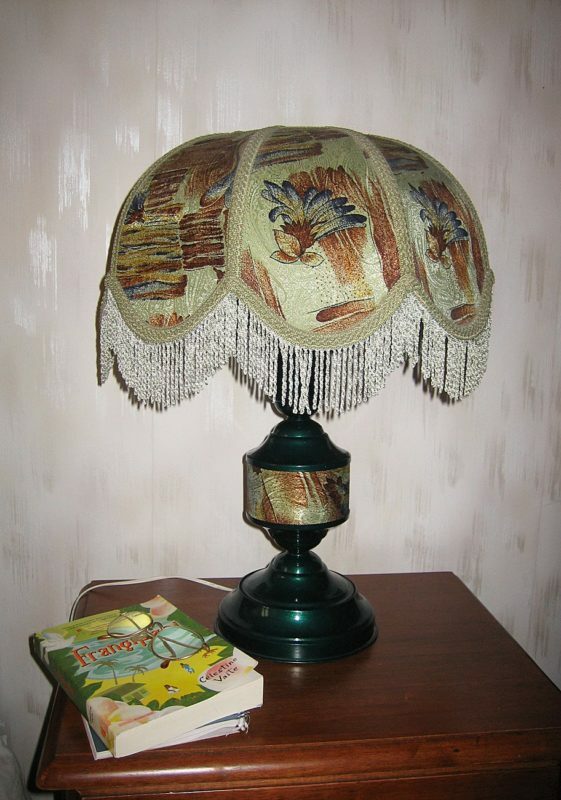 And yes, that lamp needs to be immortalized! In Japan, my husband, who shaves his head, was forced to wear a swimming cap in the local pool. He had to buy a cap just so he could swim. Honestly, it would have made more sense if they’d gotten him to wrap his body up in cling film.